It’s October, let the Halloween countdown begin! Halloween has always been one of my favorite holidays. Costumes and candy, what’s not to like? These days I get my thrills vicariously by handing out sweets at the door, but when I was a kid there was nothing like going out trick-or-treating with a group of friends. 1. In a Dark Dark Room and other Scary Stories Alvin Schwartz, Dirk Zimmer (Illustrator) This was the first ‘scary’ book that I had, and I loved it beyond compare. A collection of short stories with just enough scare for young readers. 2. I Spy Spooky Night: A Book of Picture Riddles Jean Marzollo, Walter Wick (Photographer) From the mad scientist’s laboratory in the basement to a spooky cemetery in the backyard, this visual walk through a haunted house is hours of spine tingling fun! 3. The Gashlycrumb Tinies Edward Gorey The definition of macabre. 4. Coraline Neil Gaiman This story is exciting and eerie, and does what all the best fairytales do: speaks to our deepest fears and helps us face them. 6. Jennifer, Hecate, Macbeth, William McKinley and Me, Elizabeth E.L. Konigsburg After reading this book, I became obsessed with becoming a witch. Not strictly spooky, but a great story about loneliness and friendship (and witches). 7. The Pickle King Rebecca Promitzer The atmosphere of this book is so deliciously oppressive it felt like I was reading underwater. And there are ghosts too! 8. Skulduggery Pleasant Derek Landy A great action series with a skeleton detective and his apprentice/sidekick, Valkyrie Cane. 9. The Witches Roald Dahl Roald Dahl pulls no punches, the Grand High Witch is the scariest character I encountered as a child. 10. The Wardstone Chronicles Joseph Delaney Another great series. Thomas Ward is the seventh son of a seventh son, specially gifted to fight creatures of evil. The books follow his apprenticeship with the current Spook (professional evil-fighter) as he learns and battles all manner of things that go bump in the night. 11. One Day at Horrorland (Goosebumps #16) R.L. Stine I read Goosebumps like they were popcorn, but this was always a special favorite because of my childhood summers at Wonderland in Ocean City. 13. The Letter, The Witch and the Ring John Bellairs I could put all of John Bellairs’ modern-gothic books on this list, but this one will always be my favorite. Rose Rita Pottinger and her friend (and real live witch) Mrs. Zimmerman are drawn into a terrifying world of occult mysteries. Fun random fact: The baby in that picture is Ryan O’Keefe from the band River Whyless. Clifford the Big Red Dog is his brother Brendan: puppeteer, performer, builder of magical dwellings, and general renaissance man. The little Rainbow Brite? That’s me! This entry was posted in Books, Miscellany by Sarah Rubin. Bookmark the permalink. 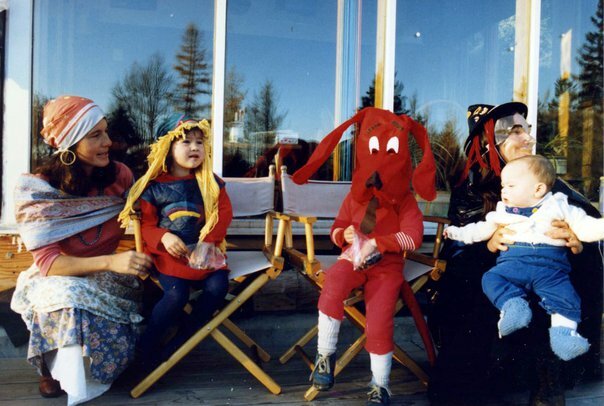 Love this picture and your book recommendations, and love remembering all your great costumes and the Halloween fun we had through the years.